Seraillon is on temporary hiatus and expects to return in early November. Now anticipation is an odd thing as we all know – imaginative, credulous, and sure of its facts before the event; difficult to please and overcritical when the time comes. Reality never seems enough to it, because it has no real idea what it wants; and it exacts a bitter price for whatever sweets it may have mistakenly supplied on credit. There are times when one’s anticipation concerning a work of literature seems to create a kind of parallel version of the work in one’s mind, such that when one finally does read the book itself it comes off as nothing quite like what one imagined. I’m not sure that I agree entirely with the last sentiment in the quotation above from Alessandro Manzoni’s 1827 novel The Betrothed, a book I’ve packed and unpacked during several moves without ever reading it. In fact, my long drawn out anticipation supplied, on credit, one kind of sweets, only to be rewarded and delighted with a different sort with no bitter taste at all. An historical romance in the literal sense and a kind of Christian parable of faith and redemption, The Betrothed, set in Milan and the Italian lake country, follows the star-crossed fates of young Lorenzo Tramaglino and his fiancée Lucia Mondella during the years 1628-30 as their relationship is repeatedly tested by the institutions of politics, the church, and social/class relations, as well as famine, wars between city states and an epidemic of plague. The novel’s romantic aspects are in full flower, with characters in strong relief: villainous villains and heroic heroes, dastardly bravoes and damsels in distress, and a cast of memorable minor characters (one favorite: a humble tailor obsessed with reading literature and philosophy). Forming the core of The Betrothed is the Christian transformation of a powerful, wicked warlord, scowling at the joy of the people in village below his mountain keep, into a large-hearted, generous hero (a scenario so resembling Theodor Seuss’ How The Grinch Stole Christmas in certain particulars that I began to suspect Seuss might have lifted the idea right out of Manzoni). The historical side of the novel is often exactly that: whole chapters in which the story of Renzo and Lucia, temporarily held in abeyance, is replaced by richly researched historical accounts of the warring states of pre-republican Italy and the epidemic scourge of the plague, replete with references to the texts consulted and conveying a surprisingly gripping realism. This is a large novel with a labyrinth of avenues to explore, but in the interest of brevity, I’ll just mention a few elements I particularly appreciated. The first is Manzoni’s charming narrator and his employment of a familiar framing device: the ascribing of his story to another. The Betrothed begins with a page-long excerpt from a “defaced and faded” manuscript from 17th century Italy. While “wrestling with the job of deciphering a large blot which came after the word ‘Accidents,’” the narrator decides to abandon his attempt to transcribe the document, seeing it as “nothing but turgid declamation built up out of heavy-footed solecisms; and running through it all…that fatuous stylistic ambition which is so characteristic of the writings of the time in Italy.” But rather than totally reject “such a good story,” he elects to “take the sequence of facts contained in his manuscript…and merely alter the language.” This device – a way in part to shift the author’s responsibility for the work to an imaginary other and so deflect censorship or worse (in Manzoni’s case it appears to have been done perhaps as much from delight as from caution about offending certain important families) calls to mind similar strategies used, for example, in Fernando de Rojas’ Celestina and Cervantes’ Don Quixote, but its use here is perhaps the most clever I’ve encountered in my reading, and the invented excerpt is a riotously executed tour de force. Manzoni’s delight in constructing this manner of framing his story carries over to the rest of the narrative, recounted in a conversational tone finely attuned to the narrator’s readers, with a strong awareness of the audience and of what makes good literature (the narrator makes several references to authors whose work is unlikely to withstand the test of time, and/or likely to be found piled up “in the second-hand bookshops”). Long passages, particularly the historical ones, are invariably followed by a gentle apostrophe to the reader and a promise – immediately fulfilled – to return to the story of the young couple, with a coy mea culpa to the reader for having abandoned these key characters for so long. The novel’s somewhat clunky structure, with many lengthy digressions, is saved by this graciousness, the narrator always paying keen attention to righting his leaning story and offering the reader more than a few self-deprecating comments (i.e., in reference to a character, “…he was as anxious to reach his journey’s end as certain of our readers may be.” 692). I was also struck by Manzoni’s keen insight into social relations across a wide swath of society and social institutions, as well as an eye for observing behavior particular to an age. His novel takes in all classes, but focuses especially on the plight of common people, presenting their day-to-day lives with a fullness that called to mind the paintings of Pieter Brueghel the Elder. He exposes the inefficacy and hypocrisy of authorities and laws (The Betrothed’s focus on matters of justice extends from the laws of the country to the most intimate interpersonal matters). Manzoni also demonstrates a fascination with the sociology of mob behavior (featuring some genuinely frightening scenes of what mobs are capable). Early on, I feared that the book’s moral core, so strongly Christian, might turn into a collection of homilies and remonstrations. Instead, Manzoni proves to be an empiricist committed to evidence and intellectual inquiry, dismissive of the superstitious and self-serving aspects of religion (which get pilloried in The Betrothed), and to have taken the Christian notions of redemption and forgiveness to heart in a profound way. A speech by the book’s evident hero, the Cardinal Federigo Borromeo (an actual historical figure) to a weak and timid country priest serves not only as a magnificent piece of philosophical argument but a genuinely moving plea for Christian responsibility, commitment and sacrifice. 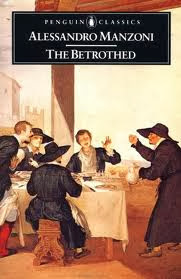 The Betrothed contains such a rich trove of literary treasures that it would be hard to pick a favorite among them: the marvelous language of the found manuscript that begins the novel; Father Borromeo’s moving speech regarding the commitment of the priesthood; the unforgettable descriptions of the plague’s ravages or of the marauding, warring hordes from the north; an account of a riot over bread bristling with movement and tension; the gently humorous graciousness of the narrator; even, perhaps, unexpectedly inserted into the narrative, a brief but lush description of a humble home’s garden. The narrator needn’t have worried about his readers (this one, in any case) growing eager for the novel to end. I’d have preferred it to go on and on; The Betrothed is a book I expect to return to again and again with great anticipation.